This month we shine the spotlight on FRC 3229, Hawktimus Prime. 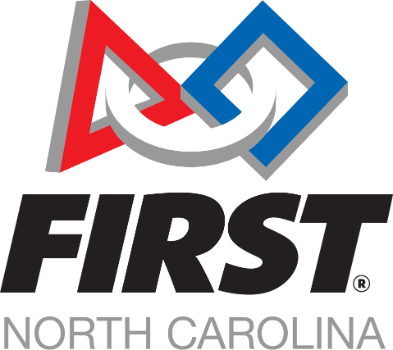 Based in Holly Springs, this team is the host site for one of the upcoming FRC District Qualifying Events. Hawktimus Prime is a growing team with 16 leadership positions and around 50+ members this season. We were founded and made our home in Holly Springs, NC at Holly Springs High School. Our team reaches out to and works with our local community for members and opportunities to spread FIRSTideals. What has been a highlight for your team over the years? Hawktimus Prime started competing in 2010. It took our team several years to become more competitive. Two years ago we qualified for the State Championship and won! We then went on to compete in the FIRSTChampionship in Houston. This was a major improvement for our team! 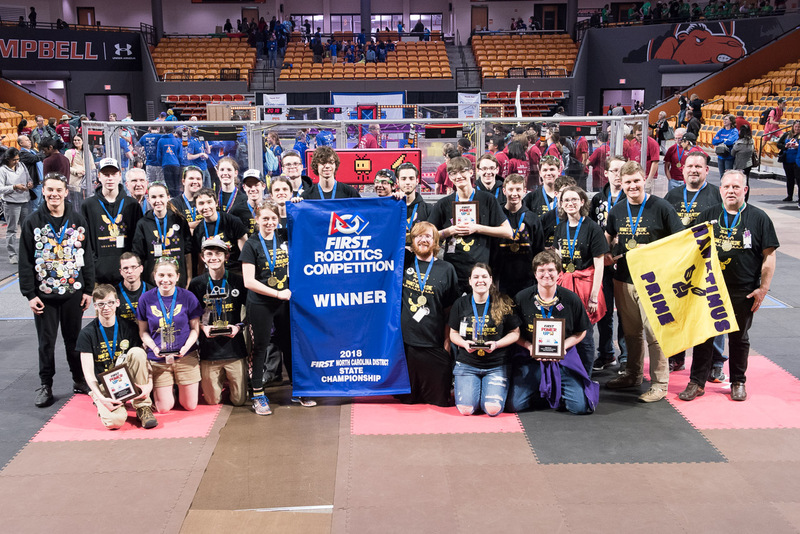 A definite highlight for us was repeating our success in the Power Up season and being the first North Carolina FRC team to win two State Championships in two consecutive years. Tell us about one struggle your team has overcome and how you did so. All of these made sure everyone working on the robot was aware of what others were doing. Planning ahead and collaboration has greatly influenced our growth and has lead to our successes in competition. What words of wisdom would you give to a rookie team? If we were to pass any advice onto a rookie team, we would emphasize the importance of communication. Communication within a team (or maybe even with other FRC teams) is important to relay ideas and plans so everyone can work harmoniously together to be proud of the end result. What does FIRSTmean to you and your team? FIRST is a wonderful experience for us. This organization has provided the possibility for Hawktimus Prime's students to fully explore the world of STEM in an encouraging and competitive environment. We have been able to meet wonderful people who have inspired us in the areas of math and science and peers who share the same passions. We at Hawktimus Prime share an overwhelming appreciation for the people in FIRSTwho have made all this possible. As we bring in a new year, many of us take time to reflect on the past year. I lost one of my primary mentors in life this holiday season. And as our teams gear up to launch the new FIRSTRobotics Competition season with Kickoff on January 5, I find myself in awe of the amazing people who take the time to mentor so many students. Looking back at how much Gerry influenced my life for over 40 years, I realize what a treasure the mentors are as they come into our lives. Here are a few of the key lessons I learned from him, beginning in high school and throughout my life. 1) Always give your best effort. If something is worth doing, then putting in your best effort is the only path forward. To do otherwise is a waste of your time and the time of those around you. 2) Mistakes happen. What you do with them determines your progress. Mistakes are a part of life and learning. How we react to our mistakes makes a big difference in what happens next. Beating yourself up and focusing on missteps is not productive nor helpful. Rather, learn from them and move on. 3) Life isn't always fair - so what. It doesn't define who you are. How you react is more important. Sometimes the best talent doesn't get the reward. Sometimes your best efforts don't bring the prize home. At the end of time, who will really remember or care? What matters is what you do next. 4) Learning is a life-long project. Relish every minute! Looking for the silver lining and finding the humor in everything helps ease the bumps in life. Learning how to laugh at your human foiblescan make any day brighter. 6) Love what you do and do it well. 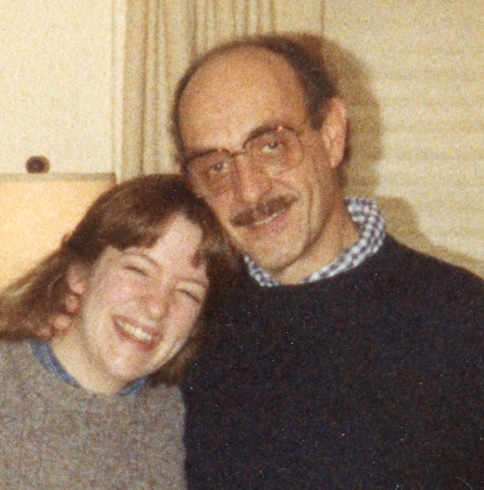 Even though my path didn't ultimately go quite the way we both anticipated, Gerry always let me know that my choices were the right ones as long as I was happy and fulfilled. That confidence and support have been invaluable throughout the years. Who has been a mentor for you? Take a moment to think about the many ways all of your mentors have played a part in your life. And if they are still around, make the time to say thank you. To all the mentors out there, know that you are making a difference. The students you impact may never have the opportunity to thank you for your time and dedication. They may not realize how much you have shaped their lives until much, much later. Your confidence in their ability to make decisions, learn from mistakes and to be good people is making a difference, each and every day. Thank you for all that you do! Your generous donation can help more students become involved. Donate here today! Thank you!! Students at Jesse Wharton Elementary in Greensboro had a blast this fall participating in the FIRST LEGO League Jr. MISSON MOON season. Groups of students worked together to learn about and explore living on the Earth's Moon. They built rocket ships and moon bases to demonstrate what they learned and how their groups would make a life on the moon. Check out the video below highlighting the student's work and the fun they had as they carried out their mission! FLL Jr. teams were "over the moon" earlier this month during the FLL Jr. MISSION MOON Expo at the Carolinas Aviation Museum. Students showcased their LEGO Moon bases and Show-Me posters. They also learned about aerodynamics through paper planes, making a button, working with LEDs and more. We ended our time together with an award ceremony, high-fives, smiles, and a little surprise for each participant. Thank you to the Carolinas Aviation Museum and FRC 3506 YETI for all your help and support to make is a great event for all! I work at Fitbit as an Electrical Engineer. I am responsible for helping to research, design, and manufacture the next generation of Fitbit products. Just over a year. However, I also did an internship there. The greatest part of every year was the first time the robot started to drive around with all its systems on. At that point it was probably still overweight, and probably still only half worked, but everyone could see the fruits of their labor and start to feel that they were really doing something cool. 2. Solving an abstract problem - No one tells you how to design the robot in FIRST, you are simply given a challenge such as "make a robot that shoots balls into a hoop". The same thing happens in an engineering job. You might be told something like "make a fitness tracker that lasts 7 days on a charge, has a touch screen, and is waterproof". In fact in later life, it's even more abstract. There are no limits to what you can use to solve the problem, your kit of parts is whatever you can find on the entire planet! There is also often no rulebook, this might seem fun, but actually, it's hard. A lot of the FIRSTrules are designed to make sure your robots don't catch on fire or start disobeying the first law of robotics. In engineering out in the world its often YOU who has to write the "rulebook", which manifests itself as some kind of validation plan or safety tests. 3. Teamwork - Engineering problems are often difficult and can't be solved by one person alone. To succeed at engineering you must learn how to all come together, find everyone's strengths, split up tasks, help each other, and most important of all, have trust that you and your teammates will succeed. FIRSTreally cemented my love for electrical engineering. I think the lessons it taught me really put me ahead in college and set me on a great career path. Some of the concepts like "gracious professionalism" still stick with me today and shape my worldview. Apply yourself! You only get as much out of an experience as you put in and there is A LOT to get out of an experience like FIRST. It's quite frankly a revolutionary program that is really a great first step into the world of engineering. Not to mention, today is a great time to be an engineer. As you go through engineering school, you will get exposed to and be amazed by all the fantastic things that people are up to. Technology is a powerful force for good in the world and we are on the brink of some amazing advancements in areas like autonomous vehicles, genetic engineering, artificial intelligence, and, of course, robotics that will change and improve life to an astounding degree. This month we shine the spotlight on FRC 2640, Hotbotz. The Hotbotz are based out of Rockingham County, NC. FRC 2640, the Hotbotz, can easily be identified by our hot pink t-shirts, our hot pink robot, and our mascot Willie the Chili Pepper. We are a community team and the only FRC team in Rockingham County. This year, our team merged with Rockingham Early College HS as a student-led club. We are excited that we now have members from all over Rockingham County, representing five High Schools. The Hotbotz started as a predominantly girls team. We have consistently been award winners for imagery for our iconic, hot pink powder coated robot. We were 34th in the world in 2012 and have had a strong robot almost every year. We helped start THOR in NC. Our members have helped lots of young students develop a love of robotics, and we have had lots of fun doing it! Last year we really struggled with membership numbers and we only had 7 to 8 members at any given competition, which was not enough to effectively compete on the field, scout, and staff the pit all at one time. We faced potential extinction when some of those members graduated and we were down to only a few students for this season. We attended open houses, held interest meetings, and raised awareness through social media and word of mouth in order to gain more members. We also integrated our independent community team into Rockingham Early College HS and as of now we have recruited over 30 new members! We're Back! We are a rookie team! Despite the fact that we've been around for 11 years now, we have almost all new members this year. The advice we would give is to never give up. Even if you think you don't have everything you need to succeed, keep going, because even when things look bleak it can all turn around if you make a plan and work the plan. To the Hotbotz, FIRSTis community, friendship, working with and honoring people different than yourself, trying to win but doing it with gracious professionalism, chili peppers, fundraising, education, hard work, excitement, being "line-dancing-challenged," fast food, geeking out on STEM stuff, creativity, and most of all, PINK!